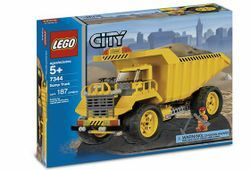 7344 Dump Truck is a City Construction set released in 2005. It includes a large dump truck with a tipping dump bed and a construction worker. This is a description taken from LEGO.com. Please do not modify it. Ready to work! You're in charge of this mighty Dump Truck as it tackles another big job. Load it up, roll it where you want to go and then lift the bed to dump your load. Now you're ready to build! Includes driver & cool tools! Plus 4 rugged rubber tires to get the job done! Measures 5.5 inches/13.97 cm wide by 10 inches/25.4 cm long! Flatbed opens to 11 inches/27 cm high! Tip the flatbed and lock into upright position! Designed for easy build and instant play! Facts about "7344 Dump Truck"